We hiked into La Crosse Basin inside Olympic National Park. The walk would lead us through lush rainforest, then climb into the mountains, to visit high alpine lakes. We would bring 7 days worth of food in our backpacks, just after getting resupplied in Quinault, Wa. We started our hike at the Graves Creek Trailhead, just upriver from Lake Quinault. The East Fork Quinault Trail lead us through lush rainforest to a place called Enchanted Valley. Shortly after that, we would start our climb into the Olympic Mountains. Before reaching Anderson Pass, we would turn onto another trail, which lead us to La Crosse Basin. Want to learn more? 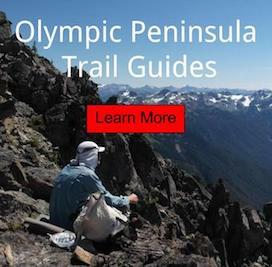 Guides to all the trails in Olympic National Park. After a resupply and hitch back to the trail - this route would lead us up a river valley into Enchanted Valley, O'neal Pass, Lacrosse Basin, Hart Lake, Anderson Pass, Dosewallips River Valley and hitch out for a few days. Looking down the East Fork Quinault River Valley, where we started this adventure. Walking the Dosewallips Road, to hitchhike back to the city for more food. Overall this was a great hike. Lots of dynamically changing landscapes and a healthy variations of wildlife. I especially liked viewing all the Olympic Black Bear cooling off from the summer heat in snow. That was a real treat. I would definitely recommend this trip to others, as it's a great way to see what Olympic National Park has to offer, and why it is important that it is preserved for the next generations. or read the next page of story 30+ Days in Olympic National Park.